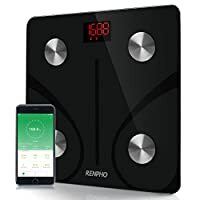 Smart Digital BMI Body Weight Scale with Smartphone App..
Specifics/Features — Powered by 1.5V(x3) AAA batteries.. Backlit LED display.. Overload and Low Battery Indication.. Auto on/off function.. Auto calibration.. High precision sensors.. 5mm Tempered Glass Platform.. Smart App Syncs with Fitness Apps Control.. Supports Bluetooth 4.0, Android 4.3 and IOS 7.0 or above systems.. kg/lb Units.. 396lb/180kg Capacity.. 0.2lb/50g Division..